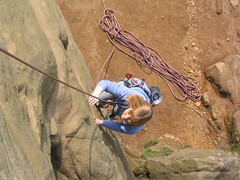 Finally a days proper climbing outside, with photos! 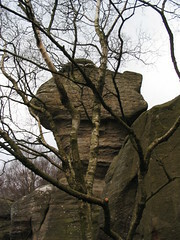 We went to Brimham Rocks, in yorkshire. An early 8:45 start, followed by an 1 1/2 drive got us there about 10:30. We picked up Ian, our friendly ‘mentor’ who has kindly taken us under his wing. The place itself is amazing, some really bizarre rock formations (see above photo). We started the day off on Cubic Rock, we seconded Great Slab and then I lead Heather Wall in the middle. My first Severe lead. 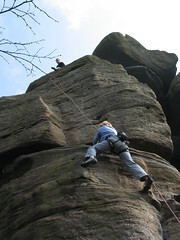 Moving on over to Lover’s Leap we seconded Birch Tree Wall, a lovely VS 4c. Then we went and did some silly slabby VDiff thing (Lichen Slab) while Ian did Enigma. We then tried to do Gnome Arete, and failed miserably. 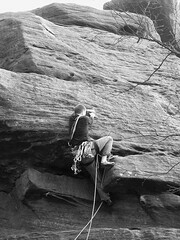 The start was the hardest part, some damn small crimps and some very delicate feet smear/balance work required.